The First Official Look At Judi Dench & Sam Mendes Filming ‘SKYFALL’! 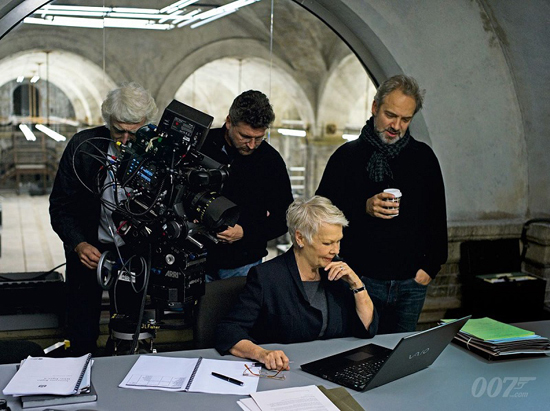 007.com has the first official look at Judi Dench, Sam Mendes & Roger Deakins on set of latest James Bond movie, Skyfall. The Photo accompanies an announcement revealing that on Wednesday the site will be revealing Mendes’ first Skyfall video blog. The director states "The roots of my doing this Bond movie start way before anybody approached me because, like everyone else, I have my own personal relationship with Bond which began when I was I suppose about nine or ten years old. I’ve always been a fan of the movies." Skyfall sees Daniel Craig & Judi Dench reprise their roles. The cast also includes Naomie Harris as a field agent named Eve, Javier Bardem as the lead villain, Albert Finney, Ben Whishaw as Q, Rory Kinnear as Bill Tanner, the MI6 Chief of Staff, Ola Rapace, Bérénice Marlohe & Ralph Fiennes, who’s role has been described as 'darkly complex'. The movie hits UK theaters October 26th & US theaters November 9th. I'm reading: The First Official Look At Judi Dench & Sam Mendes Filming ‘SKYFALL’!Tweet this!